Woven Wheel Stitch is an easy-to-learn embroidery stitch that packs a huge punch. It is sometimes called woven rose stitch, and as its name suggests, it forms a wheel or rose-like circle by weaving the thread. Although technically comprised of several stitches, the woven wheel is referred to as a single stitch. Use it as you create bold and beautiful floral embroideries. This stitch can be worked very tightly, which will build up a thicker and more dimensional stitch, or you can keep the weaving a little looser, resulting in a softer and flatter stitch. Start with an odd number of ​straight stitches, forming a star. Five or seven stitches are a good choice. Try to make each stitch evenly spaced and the same length. Bring the needle up near the center and begin weaving the needle over and under each straight stitch spoke. Take care that you don't catch any of the threads with your needle. Continue weaving around the spokes until the circle is filled in and you can no longer see any of the spokes showing. Bring the needle back down under the edge of the weaving. If you run out of thread as you are weaving, bring the needle to the back, secure it, and start a new thread, continuing the weaving as before. When working the straight stitch spokes, you may want to use a sharp needle to pierce the fabric. When you are weaving, however, it's best to switch to a tapestry needle with a ballpoint. This will help prevent the needle from catching and pulling the weaving. 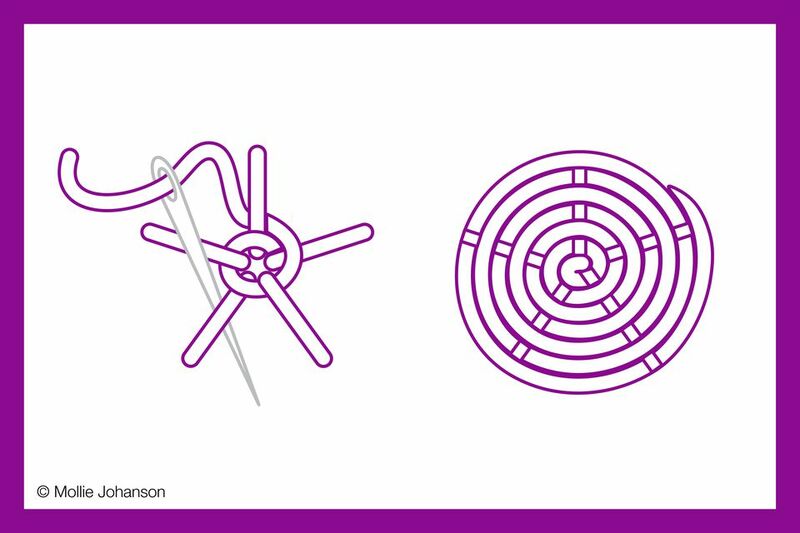 It's difficult to capture the look of this stitch in an illustration, so continue on to see a finished example and get some ideas for ways to use the woven wheel in your embroidery. The stitch on left is woven tightly. The result is a flower that is about 1/4in thick and very dense. On the right, the weaving is pulled only tight enough to bring the threads in so they are touching. This makes a much flatter flower, which can almost look too flat to be considered a 'woven rose'. To get the look above, fluff the finished flower a bit with your finger. Although shown here with only one color, you can very easily change colors throughout the stitch to create multi-color flowers or other motifs. You can also leave the center open, giving you room to fill it with other stitches, such as french knots. To do this, stitch the spokes so that they don't touch in the middle. Woven wheel stitch is also commonly used with silk ribbon embroidery. For this, stitch the spokes with a single strand of embroidery floss, then do the weaving with ribbon. As you work around the circle, pay attention to the twist of the ribbon, folding and twisting it to get the look you want. Add this to your stitch knowledge and you'll be making large roses and floralscapes in hardly any time at all!